Local authorities have decided to shut down a chemical industrial park in Jiangsu Province, eastern China, after 78 people were killed by a chemical explosion at one of the park’s onsite factories on March 21, one of the worst industrial accidents to occur in the country in recent years. According to Chinese media, the municipal government of Yancheng, where the industrial park is located, made the announcement on April 4. Following a string of chemical explosions this month, the Jiangsu provincial government also announced that it would slash the number of chemical plants operating in the following three years, with a target of a 50 percent reduction by 2020, and a 80 percent reduction by 2022. As one of the top chemical production bases in China, presently there are more than 5,000 chemical plants in Jiangsu. By 2022, the number is expected to reduce to less than 1,000. According to statistics kept by the Ministry of Emergency Management, there have been 620 chemical plant accidents across the country during a three-year period between 2016 to 2018, resulting in 728 deaths. What is the Real Death Toll? Analysts—and oftentimes, netizens—doubt the official casualty figures released by Chinese authorities, as they have a history of hiding true numbers during natural and manmade disasters. In fact, local authorities usually have a “death toll allowance” in order to protect against public criticism about their incompetence in preventing or responding to disasters. For example, on August 12, 2015, a deadly explosion occurred at the Tianjin Port. Chinese authorities’ final report stated that the explosion caused 165 deaths, 8 people were missing, and 798 people were injured. However, several media reports published prior to the final government announcements revealed that the death toll reached more than 1,000. The explosion destroyed more than 30 tall buildings in the area, razing them to the ground. A big pit at the center of explosion was clearly visible from satellite images. Similar to the explosion site in Tianjin, the Jiangsu plant was located in an area with a high density of factory buildings. 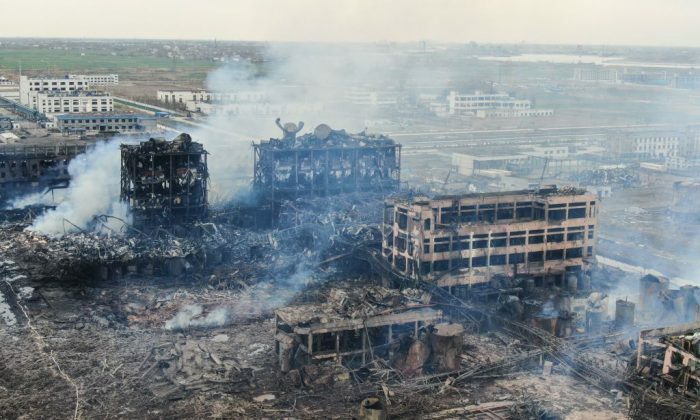 Aerial pictures of the explosion site published by Chinese media also looked very similar to those taken after the Tianjin explosion in 2015. The shock wave generated from the Jiangsu explosion was equivalent to a magnitude 3.0 earthquake, according to China’s earthquake bureau—more powerful than the biggest shock wave generated by the 2015 explosion in Tianjin. The Tianjin explosion was said to be equivalent to 21 tons of TNT detonating,or approximately 46 Tomahawk missile explosions, according to Chinese media. Many netizens, skeptical of the government figures after seeing the images of the most recent explosion, have taken it upon themselves to analyze the actual impact of the blast. In the aftermath of many explosion incidents, local authorities have continuously prevented reporters from covering the true situation unfolding. Li Runwen, a reporter from the state-run China Youth Daily, revealed in a Jan. 2008 article posted on his blog that shortly after the 2007 explosion at the Chenjiagang Chemical Industrial Park, many reporters went to Xiangshui County in Jiangsu Province to conduct interviews and report on the scene, including Li himself. “After the accident, local authorities immediately launched a series of emergency plans forbidding reporters to interview, and they did not hesitate to intimidate reporters with physical force, house arrests, or to bribe reporters with money and women,” Li wrote. Li was able to dig out some exclusive information from his on-site interviews. Local residents told him that the number of deaths in the accident exceeded 100, and that factory authorities had been secretly removing the corpses from the accident site using big trucks. This time after the March 21 explosion, local authorities again focused on battling the reporters. According to a tweet by Radio Free Asia, many media reporters brought drones to take pictures and videos. However, local authorities launched anti-drone devices to interfere with their devices. One of the drones crashed onto the ground as a result. Families of the victims were sent to hotels in neighboring counties and were placed under surveillance. Reporters who came to the industrial park were being monitored as well. In addition, authorities deleted all internet posts complaining about the pollution from the industrial park waste, which local residents had been writing about online for the past several years.